The Mayan apocalypse refers to the claims made during 2012 according to which, the world was doomed to end in December 2012 according to the Mayan calendar. The proponents of this theory based the claim on the Long Count of the Mayan calendar, which comprises of a period of 5126 years. The last cycle came to an end in 2012 and many New Age theorists believed that this would mark the end of the current era of the world. Some construed it to spell a doomsday like scenario ending in an apocalypse. However, the theories of an apocalypse came to nought when the December 2012 passed away without any major astral events. Mayans had a number of different creation mythologies. One of these, as mentioned in the extant Mayan book Popul Vuh, states that the gods created the world three times before but each of these attempts failed on one account or another. Each of these previous world, according to the Mayan mythology, lasted for a period of 5125 years. Mayans believed that they were living in the fourth world created by the gods. Recent interpreters used the Mayan Long Count calendar to prophesize that this fourth world was coming to an end on 21 December 2012, effectively marking the end of this world. Although no apocalypse took place in 2012 at the close of the Mayan calendar, a huge wave of panic gripped major portions of populations all over the world. Theories regarding the significance of the completion of Mayan Long Count calendar have been frequent throughout the 20th century. Many New Age authors claimed that when the Long Count calendar ended, it was going to bring huge changes to the world. Some went on to claim that Armageddon, or an apocalypse, was imminent as soon as the calendar reached its end. These theories became more frequent in the present century as the Mayan Long Count moved to its conclusion. As the New Age authors repeatedly affirmed that a doomsday was imminent upon the conclusion of the Mayan Long Count calendar, many theories were proposed as to how exactly such an apocalypse would happen. One of these theories referred to the alignment of astral bodies in a specific pattern. It was specifically proposed that in December 2012, the Sun and a supermassive black hole would align in such a way as to disrupt the gravitational field of the Earth. A related theory proposed that events causing mass extinctions occurred on Earth after a specific period, and that the end of the Long Count denoted such a period when another such event was expected to happen. According to another theory related to the predicted Mayan apocalypse, the Earth was expected to undergo a geomagnetic reversal due to a solar flare. 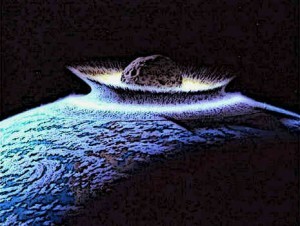 The proponents of this theory stated that such a reversal would destroy everything on Earth, possibly the planet itself. It was also claimed that the reversal of Earth’s poles would release an energy exceeding that of 100 billion atomic bombs, which was sure to bring about the apocalypse as envisaged in the Mayan Long Count. It is believed that a mysterious planet, Planet X, exists in the galaxy containing Earth. Before 2012, several proponents theorised that this planet was being channelled by the aliens and that it was on its way to collide with Earth. It was claimed that the collision is expected to happen sometime in December, 2012. Similar claims of imminent planetary collisions had been made in 1995 and 2003 as well, but the same theory was reinvigorated in 2012 as the expected Mayan doomsday drew close. Pleiadas is a large star cluster which also came up in the 2012 Mayan apocalypse theories. According to one of these theories, the Earth and the largest star in Pleiadas, Alcyone, would be aligned in such a way that the latter would exert a certain force on Earth. It was claimed that the photons emitted by Alcyone form a photon belt which can disrupt Earth’s orbit. However, this theory was rebutted by the fact that the Earth’s solar system is moving away from the Pleiadas cluster, rather than moving towards it as predicted by the theory. Betelgeuse is a red supergiant star that exists at a distance of 600 light years from Earth. The star is on the last leg of its life and is expected to erupt in a supernova. It was claimed that the supernova of the star will take place in 2012 and that it will have cataclysmic affects for Earth, thus fulfilling the Mayan apocalypse theory. This theory was rebutted by the fact that there was virtually no way of predicting the supernova. It was also stated by scientists that a supernova within a distance of 25 light years may have any possible impact on our solar system, whereas Betelgeuse was at a distance of 600 lights years and even if it underwent supernova, that wouldn’t impact Earth. Although no apocalypse took place in 2012 at the close of the Mayan calendar, a huge wave of panic gripped major portions of populations all over the world. As the date of 21 December 2012 drew near, people turned to internet to ask others if a Mayan apocalypse was imminent. As a result, hundreds of thousands of websites on the subject sprang up in no time. Considerable percentages of populations in U.S., Russia, China, Turkey, Japan and Korea expressed their belief that such an apocalypse was expected to happen at the end of the Mayan Long Count calendar. The Mayan apocalypse refers to a number of different theories which ties the end of the Mayan Long Count calendar to an apocalypse. The Mayan Long Count calendar ended on 21 December 2012. It was variously proposed that the date marked the end of the world in one or more cataclysmic events. Some theories proposed that this would happen because of adverse galactic alignments while others forwarded other possible explanations. All these theories agreed on the prediction that the date marked a major disruption for Earth, possibly its annihilation for good.